‘A New Ordinary’ was another disappointing episode in the Boruto anime. No one faced any consequences for their actions as the latest episode decided to brush everything under the rug. I understand the Boruto anime is primarily targeted at kids. However, seeing the anime ignoring the concept of facing consequences and allowing the main characters to move on with their lives as if nothing happened was disappointing. Furthermore, the fact the writers decided to kill Onoki showed how they weren’t ready (or just didn’t care) to make the old ninja accept any responsibility for his actions. Except for a few emotional moments between Mitsuki and Boruto, ‘A New Ordinary,’ came across as a very weak episode. I was looking forward to Team 7 accepting their punishment when they returned to the Hidden Leaf Village. The beginning of ‘A New Ordinary’ made it seem the writers were going to teach Team 7 a lesson about certain rules in the ninja world. Boruto, Mitsuki, and Salad had their Genin status stripped away. It also seemed Mitsuki was going to leave the Hidden Leaf Village for a while. I was okay with such level of punishment because Team 7 was able to help stop Ku’s evil plans, even if the young ninja broke some rules. But then Kurotsuchi came to visit Naruto and due to her proclaiming Team 7 as heroes, the Hokage had to give back their headbands. I want Boruto and his friends to be rewarded for their deeds; however, I think the entire situation could have been handled a lot better to let Boruto and the rest realize their actions, even though heroic, have certain unfortunate consequences. As for the emotional moments, I liked Boruto’s reunion with his mother and sister. Even Salad shared a hug with Sakura. Boruto also cried a few tears due to Onoki’s death. 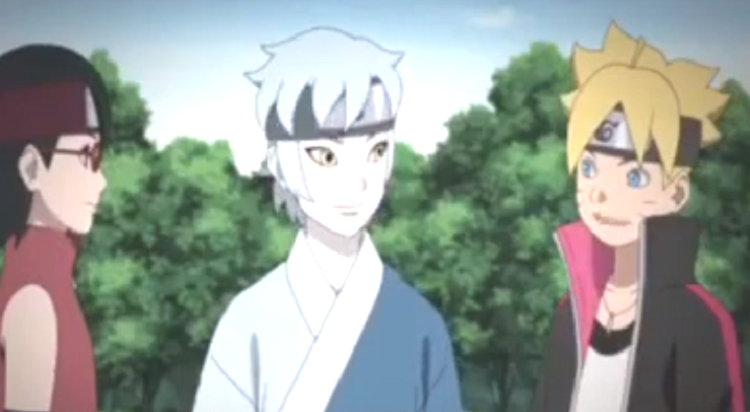 The biggest emotional moment was between Boruto and Mitsuki as the young ninjas accepted how the connection between them had strengthened due to recent events. It is going to be quite interesting to see their relationship develop considering Boruto’s love for Mitsuki is platonic while the way Mitsuki feels about Boruto has romantic undertones. Mitsuki continues to have Boruto’s picture on his bed! A quick little scene showed Orochimaru and an adult Mitsuki wondering who took the body of the scientist who created the Fabrications. Let’s see if the anime decides to build on that down the line. What did you think of Boruto this week? Did you enjoy ‘A New Ordinary’? Let us know.